Eyes are very sensitive part of body. Whenever any foreign material enters into eye, person feels irritation. There are various eye diseases. Conjunctivitis is one of the most widespread diseases in India and majority of people suffer from this disease in their lifetime. Conjunctivitis, generally known as pink eye, is a redness of the conjunctiva. The conjunctiva is a apparent mucus membrane that lines the within of the eyelid and covers the white part of the eye. Pink eye is a name commonly used to refer to all types of conjunctivitis. Conjunctivitis is a quite common condition, especially among school-going children. Children are usually not allowed to attend classes if pink eye is suspected, as it can be very infectious and may spread rapidly. Conjunctivitis rarely causes long-term vision or eye harm, but it can make the eye extremely red. There are numerous types of conjunctivitis. It is important for person to visit doctor when he suspects conjunctivitis in his eyes. The most noticeable symptom of conjunctivitis is a red or pink colored eye. Inflammation causes small blood vessels in the conjunctiva to dim, resulting in a pink or red tint to the white of the eye. This swelling is a sign of the immune system reacting to a foreign substance, irritation organisms, such as bacteria. This disease may produce symptoms such as redness in one or both eyes, itchiness in one or both eyes, blurred vision and light sensitivity, gritty feeling in one or both eyes, discharge in one or both eyes that forms a crust at night and excessive tearing. Conjunctivitis can result from viruses, Bacteria, Allergies, a chemical splash in the eye, a foreign object in the eye, and a clogged tear duct (in newborns). The major risk factor of catching conjunctivitis is being exposed to person infected with either the viral or bacterial form of conjunctivitis. Infected person may be transmittable for seven to 14 days after signs and symptoms first appear. Only doctor will be able to identify the type of conjunctivitis by asking questions and examining patient's eyes. The way eyes feel will usually reveal what type of conjunctivitis a person have. Viral conjunctivitis is linked with upper respiratory infections and colds. It usually affects only one eye, but can affect both eyes. Viral conjunctivitis causes unnecessary eye watering and a light discharge. Viral conjunctivitis is more widespread in children and tends to be much more transmittable than the bacterial type. Another type of conjunctivitis is bacterial conjunctivitis. This is caused by bacteria. Bacterial conjunctivitis affects both eyes and often produces a thicker, yellow-green discharge. It may also be related with a respiratory infection or a cold. Bacterial conjunctivitis is more common in children than in adults and can be infectious. Some babies are born with a blocked tear duct that prevents tears from draining properly. This may be one of the causes of bacterial conjunctivitis. Allergic conjunctivitis is caused by a reaction to an allergen, such as pollen, or a foreign substance. Allergic conjunctivitis affects both eyes and causes itching and redness in the eyes and sometimes the nose. The eyes may also appear swollen and tear terribly. In severe cases, the conjunctiva may appear blister-like. The eyes may also have a white, stringy mucus discharge. 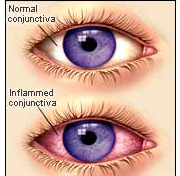 One more type of conjunctivitis is chemical conjunctivitis which causes redness and inflammation of the conjunctiva. It is caused by an irritant or an actual splash of a chemical into the eye, such as chlorine. The eye may produce clear mucus in reaction to the chemical agent. This type of conjunctivitis generally clears up on its own within about a day. Papillary conjunctivitis also referred as giant papillary conjunctivitis. 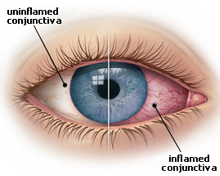 This conjunctivitis disease is caused by inflammation due to a foreign thing in the eye. Papillary conjunctivitis can also develop from exposed sutures after having eye surgery. More commonly, it is caused by the constant use of a contact lens. The eye may become red, and bumps may form on the eyelid. These bumps, called papillae, are often larger on the back side of the upper eyelid. It usually affects both eyes and causes contact lens intolerance, itching, a heavy discharge, tearing and red bumps on the bottom of the eyelid. Usually diagnosis is done on the basis of symptoms exhibited by patient. The doctor may take a sample of tears to do a test to find out the proper diagnosis. A bright microscope may also be used to examine the eyes in more detail. Appropriate treatment is decided on the basis of type of conjunctivitis. Doctor may prescribe antibiotic eye drops if the infection is bacterial, and the infection should clear within several days. Antibiotic eye ointment, in place of eye drops, is sometimes prescribed for treating bacterial pink eye in children. 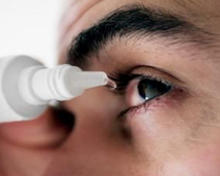 Antibiotic eye drops or ointments are not applicable for the treatment of viral conjunctivitis. In the case of allergic conjunctivitis, doctor may prescribe eye drops, such as antihistamines, to lessen allergic symptoms. If people have been diagnosed with conjunctivitis, he must follow precautions to avoid spreading of the infection. These tips include: wash hands frequently. He must avoid rubbing his eyes. He must not share washcloths, towels or pillowcases. It is important that eye drops or cosmetics, he uses must be kept for personal use only. Conjunctivitis is typically a slight eye infection, but it can be more serious condition if proper care is not taken. People sometimes use home remedy to come out with disease. This is very careless approach and there may be lot of risk involve. It is always advised to get the opinion of an eye care professional and strictly follow them to control the disease. Note: This information is just for knowledge of disease. If such type of medical condition develops, contact doctor.